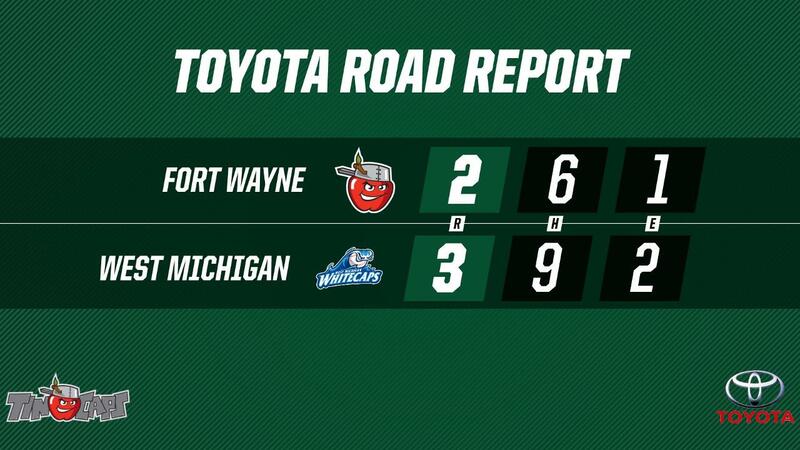 COMSTOCK PARK, Mich. -- The TinCaps' 2018 campaign ended with a 3-2, 10-inning loss to the West Michigan Whitecaps (Detroit Tigers) on Monday afternoon at Fifth Third Ballpark in their regular season finale. The two teams entered the game tied for the Midwest League Eastern Division's second half wild card, so the result sent West Michigan into the playoffs to take on the Great Lakes Loons in the Eastern Division Semifinals beginning on Wednesday. With the score tied, 2-2, in the bottom of the 10th, West Michigan (33-36, 69-70) first baseman Anthony Pereira hit a sacrifice fly to right field that scored Brady Policelli from third base to win the game in walk-off fashion. Fort Wayne (32-37, 64-74) had scored in the top of the 10th inning to break a 1-1 tie. Given the new rule in Minor League Baseball this season that calls for teams to start extra-inning frames with a runner at second base, the TinCaps had second baseman Kelvin Melean in scoring position for the top of the order. Center fielder Jeisson Rosario put down a sacrifice bunt to move Melean to third. Left fielder Jack Suwinski drove him in with a ground out to short. In the bottom of the 10th, however, West Michigan's leadoff batter, Policelli, drew a walk. When a wild pitch advanced their "extra runner" John Valente to third and Policelli to second, Fort Wayne intentionally walked Wenceel Perez to load the bases. Colby Bortles hit a line drive that went off the glove of pitcher Evan Miller and redirected toward second where it went off Melean's glove as well but eventually fell into center field, allowing Valente to score and tie the game. That set up the heroics for Pereira, who, ironically, only came into the game after the starting first baseman for the Whitecaps, Jordan Pearce, was ejected for arguing balls and strikes in the bottom of the first. Pereira wound up playing first base for the first time in 403 career Minor League games. Early on, the TinCaps looked primed to reach the Midwest League Playoffs for the ninth time in 10 years. Following a 47-minute rain delay, Fort Wayne scored an unearned run in the top of the first. Suwinski was hit by a one-out pitch from right-handed starter Jesus Rodriguez. After a ground out advanced Suwinski into scoring position, with two away, shortstop Gabriel Arias hit an infield single toward short. Perez, trying to throw Arias out at first, threw high, enabling Suwinski to score and make it 1-0. The TinCaps' 1-0 lead carried through the Seventh-Inning Stretch, thanks to the former Manhattan College Jasper Tom Cosgrove. The 22-year-old left-hander from Staten Island, N.Y., blanked the Whitecaps through six innings. West Michigan, though, eventually equalized in the seventh with their classic small-ball style. Reynaldo Rivera led off with a single, and got to third thanks to a sac bunt and a wild pitch. Pinch-hitter Joey Morgan grounded out to second, but drove Rivera in to level the score, 1-1. Cosgrove matched the longest outing of his pro career by going seven innings, striking out seven, walking only one, and scattering seven hits. Lefty reliever Dan Dallas followed Cosgrove with a scoreless eighth, and Miller matched that in the ninth. For the Whitecaps, Rodriguez went five while Mitch Stalsberg went three in relief, bridging the gap to 25-year-old Johan Belisario, who went the last two. Fort Wayne had a runner on base in every inning but the sixth, yet went 1-for-6 with runners in scoring position and left eight on base. West Michigan was 1-for-10 in those spots with 11 left on. The TinCaps had the youngest roster in the Midwest League this season, and perhaps the most overall talent, too. But ultimately, having nine players on the Disabled List (including three top 30 San Diego Padres prospects) down the stretch, plus a pair of top-30 pitching prospects shut down (due to reaching their innings limits) proved to be too much to overcome to reach the postseason.